In the picture above is our 48 inch chess set. Usually use for garden or another outdoor area game. 48 inch chess pieces has tall size enough. If you want to have a set, you should consider about the place to put on it. 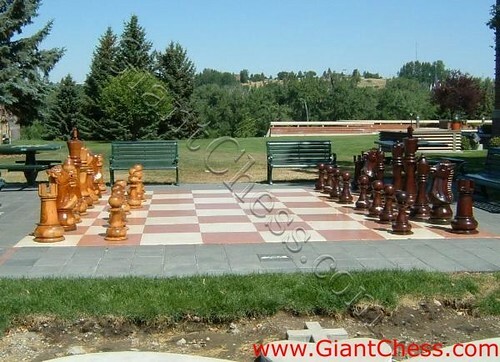 So that, this chess set more suitable for outdoor game or garden decoration. So you don't need worry about the space. For create an interesting outdoor game with you family or friends, use 48 inch chess set and completed with a wide enough of chess board, which has suitable size for the chess pieces. Do not worry about its damaged, because those chess pieces has made from best quality of Teak wood and carved carefully by expert craftsman. Looks so gallant and interesting in giant size. Those also have polished in perfect color. Very durable for outdoor use, because the main material of those chess pieces are the strongest wood in the world. Durable for any seasons and weathers, so you may left it at your garden for months.